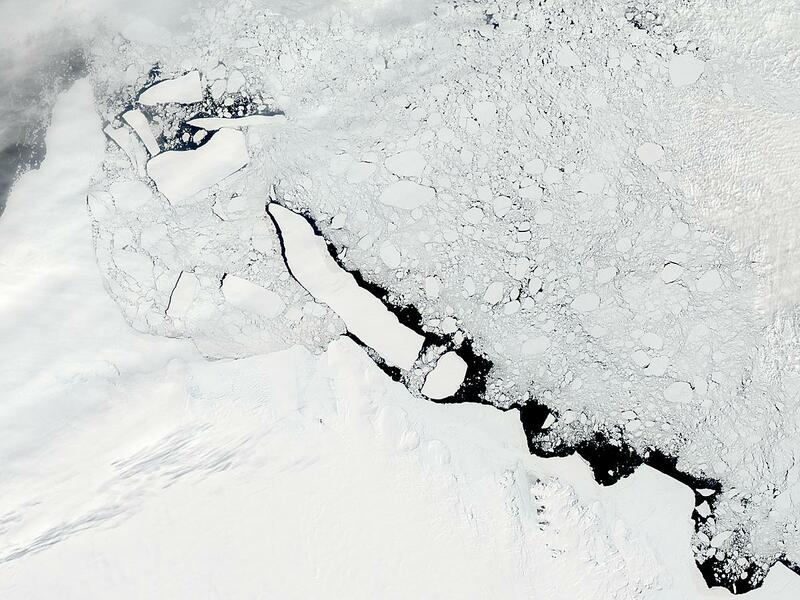 The massive C-19 iceberg has moved out of the Ross Sea and is traveling along Antarctica’s eastern shores. This Moderate Resolution Imaging Spectroradiometer (MODIS) image shows the iceberg near Mawson Peninsula, due south of New Zealand, on December 24, 2003. The iceberg broke off the Ross Ice Shelf in May 2002. At the time, it was about 20 miles wide and 124 miles long, one of the largest icebergs ever recorded. C-19 is unusual in that it is the second large iceberg to calve off the Ross Ice Shelf in 26 months. The first, the B-15 iceberg, broke off in 2000. The two icebergs trapped sea ice in the shipping lanes used to transport supplies to the research station on Ross Island until C19 swung out to sea in 2002. The Aqua satellite acquired this true-color image.